As I use Linux as my main O/S I have learnt to live with a few things. One of them is Flash having some screws loose and BBC radio is one of the victims. Winamp’s ShoutcastTV was great, and some are still going! Just sharing some of my experiences with Arch and an old laptop that was given to me. Currently have it running on the latest kernel (3.11) taken from kernel.org over the standard 3.10.10 that came with it and KDE 4.11 for the window manager. Also uses Chrome with Chrome’s pepper-flash plugin for Youtube and such. Even crammed OpenJDK 1.7.0_40 on there to run a Minecraft server. Ran fine with 1 user on the local network, only one hiccup in 30 mins or so. Poor thing took 4 hours to compile the kernel but I think overall it illustrates that old hardware is not dead hardware. I would think this old laptop would make an ok web server for testing. First things first, take a read of both the Install Guide and the Beginners Guide. Arch is a great introduction for getting under the surface of Linux. Over the last few years I have installed Arch on multiple machines but these guides are great for getting to understand some of the things happening under the hood; And if you dont want to learn you can always blindly stick in the commands. This tutorial expands on the first post about getting the Dream Cheeky Thunder Launcher working within Java. This tutorial is on Face Detection. There will be another tutorial on Face Recognition. The difference is Face Detection can find a face in a complex scene where Face Recognition will find a face in a complex scene, normalize it and attempt to match it to a database of faces that it has learnt previously. (Roughly) Letting the missile launcher carrying out targeted hits. After getting frustrated trying to get any Java USB library to work I figured it’s probably worth writing about one that does (It seems many are old projects). Specifically if you want to control DreamCheeky’s Thunder Turret, this guide is dedicated to you. Ever got in a situation where you have something in your clipboard ready to paste yet there is another piece of text that you need to copy and paste but you dont want to go back and get the original bit you copied. (Or you end up doing a paste, copy, paste and copy again then paste) Say hello to the beauty of Ctrl+Click. Simply highlight some text you want to copy, then Ctrl+Left Click it and drag it to where it is needed, and you can still paste your original copy. Realised that not everyone may know this handy little trick, enjoy. Many people don’t use the windows hibernate at all. Some may not know how to turn it on or even what it is but Windows will still hold back some of your drive space just in case. Hibernation is another way of saving power without having to shutdown your computer properly. When laptops go to sleep they still use a little power however hibernate uses none. When a computer sleeps it stores the state of the machine in RAM and it needs a little power to keep that information. Hibernate stores the information to disk meaning it can turn off completely and still remember everything. To make sure the system can go into hibernate it reserves some disk space the same size of the RAM. 16GB of RAM = 16GB of Drive space which is a decent chunk on a SSD. Ensure none of your power profiles use hibernate before turning it off! Watch disk space magically appear. 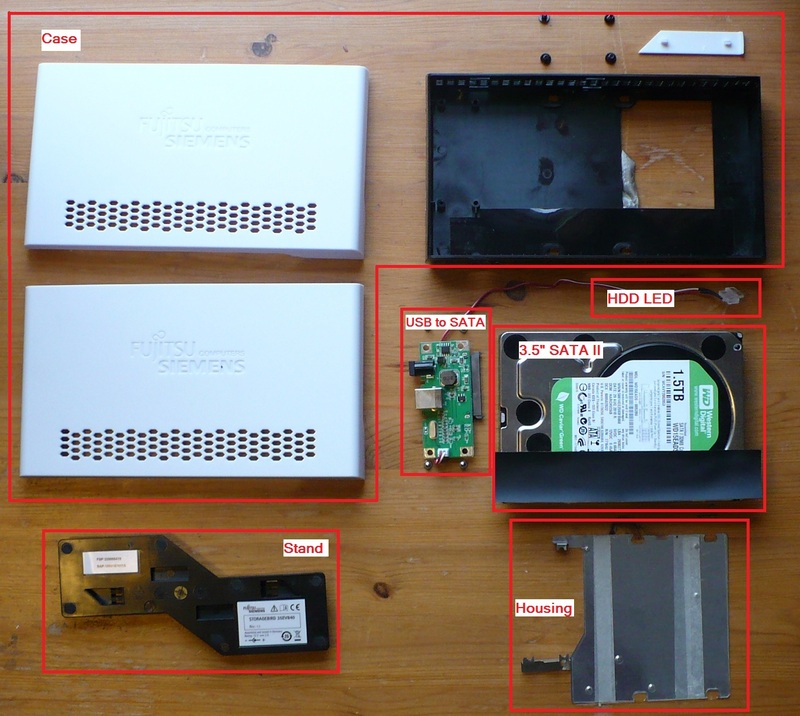 What’s Inside Your External Hard Drive? So I obtained a broken external hard drive which has lead me to an interesting discovery. In this scandalous case the cat is the main suspect for knocking it off the side. But I get to rip it apart! The patient in this autopsy is a Fujitsu Siemens StorageBird, 35ev840, Rev: 1.1. 1.5TB. Was a little bit of a pain to open due to the slightly ridged white plastic, left a few scratches on the case but nothing broken. Does not look like much does it? After googleing around a bit for a possible replacement HDD I’ve noticed something. An external HDD is cheaper than an internal one. For Example lets look at the Toshiba 2TB Stor.E Canvio External Hard Drive available on EBuyer for £60. The cheapest 2TB HDD available from Toshiba is £70 . It’s only £10 difference but its the same for the 3TB version with a £8 difference. Here is an extreme version. Hitachi Touro External HDD 4TB £125 whereas 4TB internal £203. Thats £78 Difference. The internal HDD may not be the same in the finer details like read/write and rpm (I would assume the externals are 5400 instead of 7200) and this is assuming it is a standard HDD inside but for raw space that is quite a saving. I picked the cheapest available 4TB HDD to compare it with. At the end of the day it might just come down to externals selling better and the prices can afford to be that low. Recently I picked up some very cheap ps3s and got pretty lucky. Now I have a working one but no TV or anything like that to play it on. I do however have a nice 24″ pc monitor. Why not use that? But wait … no sound. This guide will help you setup a ps3 with sound on a PC monitor. This will now pump the sound out through the old left and right channels of the RCA connection. Now a female left/right audio connector to audio jack will do it. Now you can plug this into whatever. I use the front mic on my PC. In the recording devices tab of your system’s sound settings FIRST take the volume down to something like 5. It comes through VERY distorted and at some ridiculous volume. in the listen tab of the mic/line in properties tick the listen box. You should now be able to hear your ps3 through your PC speakers. BUT after getting annoyed at how the overclocking tool that came with my graphics card worked I went to replace that. After using this new peice of software it turns out it has a decent recorder built in, when recording at 1080p it dosent have a harsh effect on gameplay and recording at half frames were good enough anyway. So, What is this magical tool? If you dont know what overclocking is I wouldnt change any settings and just use it to record video from your games. All you have to do is load up, set your hot keys and you are ready to go! In conclusion I think it is great, And Free! Here are some VLC screenshots from a video I recorded. Its still great! I had been using my microphone with Skype for a while then it suddenly stopped working. It would give me a recording device problem in skype calls and the mic will not work at all anywhere else on the system. Also no green bars in the sound manager so it is clear the computer is not getting any sound from my mic, however the mic work on other computers. Make sure you have the drivers for your sound. Windows should be able to auto-install most but I cannot gaurentee you do not need them. Right click the speaker icon in your tray (Bottom right) then click recording devices. Click pretty much anything as they should all have the same driver but click a mic if it is there. For me I selected “Front Mic”. Click the Properties button at the bottom right of the window. Under the General tab click Properties again under the heading “Controller Information” for me this was “VIA High Definition Audio”. Under the General tab of this window click “Change settings”. Under the Driver tab of this Window click Uninstall. Now you have no sound at all! This will bring up a management window, on the left you want to click the “Device Manager”. Right click on the sound section and click “Scan for hardware changes” … In about a minute or two windows should pick it up and install the default driver, If you have special drivers now would be the time to install them again.